VAIL ” Sanford Kuvin might be the flashiest skier on the hill ” for safety’s sake. 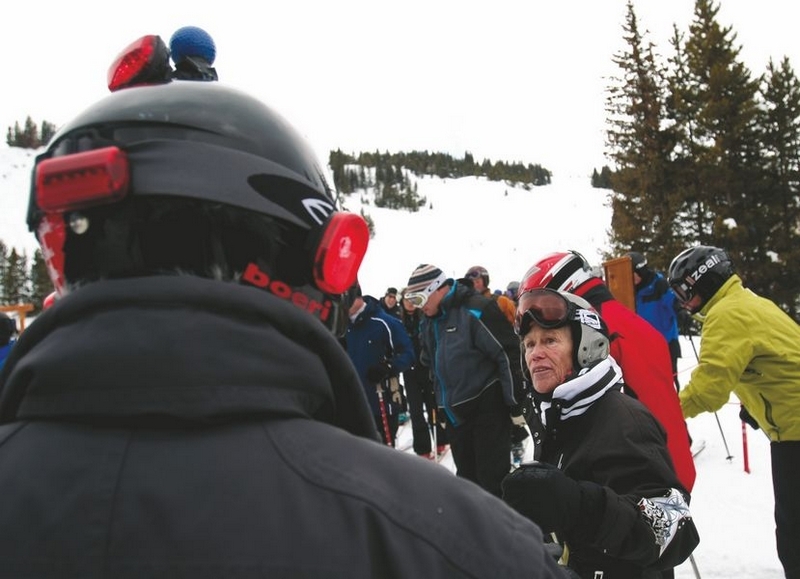 If you’ve seen the 79-year-old doctor on Vail’s slopes, you’ve probably noticed him ” he’s the one with the blinking lights all over his helmet and ski suit. It’s an effective safety measure, and it ensures that he’ll be seen by other skiers and snowboarders on the mountain, said Kuvin, who owns a condo at Vail’s Simba Run and has skied Vail for more than 10 years. He got the idea for the light ensemble after he was hit by a snowboarder in Vail three years ago, he said. He was headed down the edge of a blue run when the snowboarder came sailing out of the trees, out of control, and hit Kuvin in the ankles. At first he was livid. Then he hobbled around for six weeks recovering from his injuries. Then he got the lights. “I said to myself: ‘What’s an old man like me doing on the mountain, and what can I do to draw attention to myself to prevent this? '” Kuvin said. So he purchased six flashing bicycle lights and zip-tied them to his helmet and belt. The whole thing cost about $95, a small price to pay for safety, he said. He also carries a locator with an emergency call button and a plastic sign in his pocket that reads, “Please help.” The homemade sign conveniently attaches to Kuvin’s’ ski poles should he need to flag down help. The entire outfit is topped off by a blue Vail golf ball on the top of his helmet, covering the extension for a helmet camera. Sure, it looks pretty funny, Kuvin said, but then again, everyone has stories of their own crashes or close calls. His wife, Gabrielle, doesn’t ski anymore after a big fall. She laughed when asked if she had anything to do with her husband’s outfit.